Welcome back to 1951 Down Place, your home for Hammer Film discussion! This month, your co-hosts Casey, Derek and Scott look at the first gothic horror film to bare the Hammer Films name – The Curse of Frankenstein. Also, Casey introduces his new regular segment Gothic Glamour, and we review some feedback. 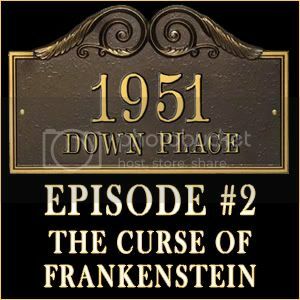 Download 1951 Down Place: Episode #002 here! Creative Commons LicenseThis work is licensed under a Creative Commons Attribution-NonCommercial-NoDerivs 3.0 Unported License. Gangrene, Dr. “The Curse of Mary Shelleyâs Frankenstein.” Scary Monsters Magazine. Oct. 2011: 86-88. Print. Hallenbeck, Bruce G. “The Making of The Curse of Frankenstein, or Pass the Marmalade . . . ” Little Shoppe of Horrors. Sep. 2008: 34-53. Print. Hammer Horror: A Fan’s Guide. Dir. Sherwood, Rorie. Phoenix Film and Television Productions: 2008, DVD. Hutchings, Peter. Terence Fisher. Manchester, United Kingdom: Manchester University Press, 2001. Print. Midnight Madness: The History of Horror, Sci-Fi & Fantasy Films. Dir. Jeff Herberger. Midnight Marquee Productions, 2011. DVD. Nutman, Philip. “The Curse of Frankenstein: The Lost Subotsky Script.” Little Shoppe of Horrors. Sep. 2008: 83-86. Print. Sangster, Jimmy. Do You Want It Good or Tuesday? From Hammer Films to Hollywood! A Life in the Movies: An Autobiography. Baltimore, MD: Midnight Marquee Press, Inc., 1997. Print. Sangster, Jimmy. The Curse of Frankenstein. Read Books Ltd., 2011. Print. The Curse of Frankenstein. Dir. Terence Fisher. Perf. Peter Cushing, Christopher Lee, Court, Robert Urquhart. Warner Home Video, 2002. DVD. Whitehurst, Derek. “Derek Whitehurst (1st Assistant Director) on The Curse of Frankenstein.” Little Shoppe of Horrors. Interview by Wayne Kinsey. Magazine, Sep. 2008. 52. Print.